College Leadership Roles: Levine Scholar at UNC Charlotte. President of Alpha Epsilon Delta Pre-Health Honor society at UNC Charlotte. What does it mean to you to be a Golden LEAF Scholarship recipient? The Golden LEAF Scholarship program allowed me to connect with like-minded students from similar areas of NC during college, so that I could better network and grow with them to be more well-equipped to return to rural NC and make a difference. Being selected as a scholarship recipient meant that the program was willing to invest in me to further my education, and that they believed I would be able to gain the skills necessary to be a leader in my community. How did the Golden LEAF Scholars Leadership Program (GLSLP) affect you? The Golden LEAF Scholars Leadership Program allowed me to work in my hometown and give back to the community that I was brought up in through healthcare research, service, and providing access to healthcare in a rural setting. I learned how to connect people with established resources in the community such as transportation, reduced-cost medications, social support, and much more. These resources help people combat many of the impediments that restrict access to adequate healthcare disproportionately in rural areas of our state. The program also connected me with many other scholars from rural areas across NC – many of these people are good friends of mine who I still spend time with after graduation, and I am sure we will continue to work and grow together as we develop into our respective occupations. Where did you participate in your rural internships through the GLSLP? I worked at the same location for my internships in 2014, 2015, and 2016. My supervisor was Mrs. Kim Smith, Health Director. My internship took place at the Columbus County Health Department, where I was a Public Health Intern. I volunteered in the following areas during my internships: registration to take records of new patients, assisting adult health nurses with various wellness visits, traveled with nurses to administer vaccinations to at-risk populations, distributed contraceptives throughout the county to combat the rising incidence rate of STIs, traveled with the health director to a state board meeting in Raleigh, NC, aided in teaching wellness classes in the community focused on living with type two diabetes, and translated for a large portion of Hispanic patients. What did you find most interesting about yourself during your GLSLP experiences? The most interesting thing about my college leadership experiences was the progression of skills across my three summer internships with the Golden LEAF Scholars Leadership Program. During the summer after my Freshman year I felt unprepared and underqualified to work at the Health Department – I was 19 years old and had very little clinical experience at that point. Fast-forward to my final year as a Golden LEAF scholar and I was much more involved and sure in my ability to assist with a variety of tasks. This evolution of my confidence in ability certainly was a defining moment in my college career attributable to the Golden LEAF program that helped prepare me for medical school. What other college experiences have affected your career goals? I worked in a research lab for two years at UNC Charlotte under Dr. Pinku Mukherjee investigating novel approaches for treating certain types of pancreatic and breast cancers. This experience gave me the opportunity to explore the process of scientific inquiry and how bench research translates into improvements in clinical care. The multidisciplinary collaboration between scientists, healthcare providers, and many others is vital to have the most beneficial impact possible. I also was heavily invested in Alpha Epsilon Delta, a pre-health honor society. Through this student organization I established healthcare-related service projects, connected students with shadowing and networking opportunities, and provided mentorship to students applying to post-graduate healthcare-related programs such as medical, dental, PA, PT, OT, veterinary, etc. What would you tell future Golden LEAF Scholars about the scholarship and/or GLSLP? The scholarship and leadership programs will help you immensely in any field you decide to pursue, and I couldn’t recommend it more. What do you plan to do after medical school? After medical school I will attend residency at MAHEC’s Asheville Family Medicine Residency Program. 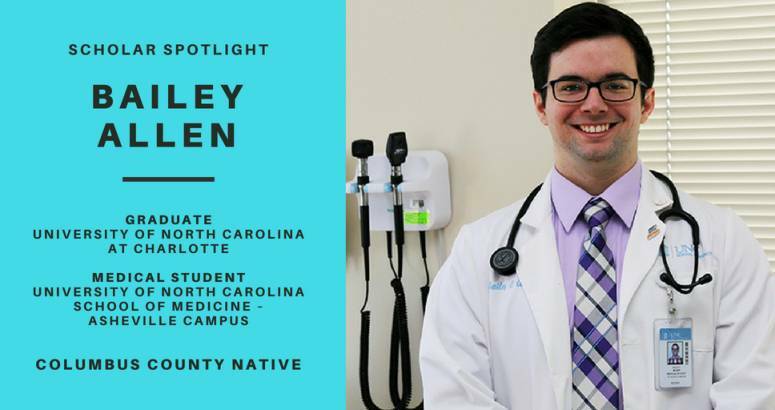 After completing my residency, I plan to practice medicine in a rural/underserved community in North Carolina.